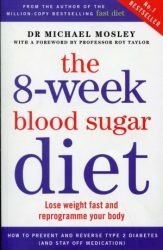 The 8-Week Blood Sugar Diet is the other book I used to understand why losing weight can be difficult. I used the information to modify my eating habits. However, as I wanted to have enough energy to run and cycle, I was not as restrictive as the book’s advice. I am not diabetic, and I have a normal blood lipid profile. Michael claims the 8-Week Blood Sugar Diet will shift an average of 14 kg in eight weeks. That is twice as much as the maximum of 0.5-1 kg a week usually recommended by health professionals for safe and long-lasting weight loss. It’s designed to shed dangerous abdominal fat fast. Therefore, it is targeted at people who are at the highest risk of ‘lifestyle diseases’ such as type 2 diabetes. I can also help anyone who has struggled with their weight and wants to get their health back on track. Done properly, the author says, rapid weight loss is an extremely effective way to shed fat, combat blood sugar problems, reverse type 2 diabetes, and even cure it. When we eat too many easily digestible carbohydrates, they are quickly broken down in the gut to release sugar into our system. These carbs include sugar, sugary breakfast cereals, pasta, bread and potatoes. Our pancreas responds by producing insulin, which helps to lower high blood sugar by encouraging cells to remove it from the blood. Carbohydrates are important for all cells for energy. However, if we take on board more energy than we require these carbohydrates are converted to fat and stored. So when you eat excessive easily digestible carbohydrates you will become fatter. As a result, the higher the release of insulin, the fatter we get. Eventually our cells misinterpret high levels of insulin as ‘normal’. They no longer respond to its’ message to take sugar out of the blood and into the cells. This can lead to insulin resistance, a precursor for type 2 diabetes. The Blood Sugar Diet aims to reverse this process, by cutting out sugar and processed carbs to lower circulating levels of insulin. For eight weeks you stick to just 800 calories a day. Eat ‘real food’, which mostly means eating lean protein-rich foods and vegetables. Drink 2–3 litres of calorie-free fluids a day. This can be tap water flavoured with lemon, fizzy water with ice, fruit tea and the occasional coffee (with only a splash of milk). There are plenty of ideas in the book if you want to take the ‘real food’ option. You simply pick one breakfast, lunch and dinner from the recipes. I bought the accompanying recipe book. This is certainly the most used and food stained book on my shelves. All the meals have flavour, and despite being low in calorie are extremely satisfying. Importantly, as Michael points out, before doing the diet you should discuss it with your doctor if you’re on insulin or a diabetic medication. You may need to plan how to reduce it to avoid too fast a drop in blood sugar. You should also consult your doctor beforehand if you’re taking warfarin, are pregnant or breastfeeding or are on blood pressure tablets. Indeed, any very low calorie diet should only be followed under the supervision of a doctor or practice nurse. Will it work to reduce diabetes? There is certainly enough evidence for the NHS to introduce an 800 Calorie a day diet. If you would like to read more about this you could read this BBC post from November last year.